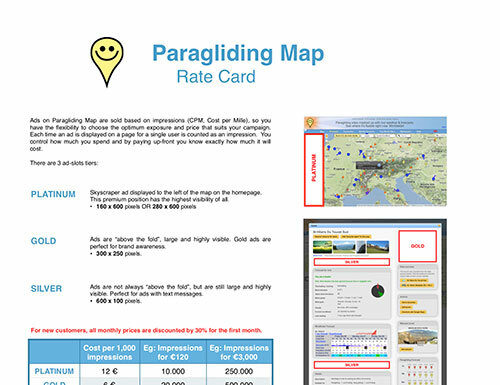 Paragliding Map offers an excellent return on investment, because our audience is highly targeted to paraglider pilots, allowing you to reach pilots efficiently. Compared to print media, we can get your brand in front of more people for less cost. Many big-name paragliding brands already advertise with us. Our audience are paragliders Our entire audience are paraglider pilots, so we can offer your products and services to a highly-targeted audience. Flexible cost You can buy as much or as little advertising as you need. Rates start from only €200. Automatically optimised Our ad system knows which ads get clicked the most and can display them more, so you get the most clicks for your money. Choose your region Ads can be limited to any specific country or region in the world, or even limited to specific languages. Multiple language support Send us different versions of your ad for each language, and we will display the correct version automatically. Metrics are tracked We will give you important metrics of your campaign, such as the CTR (click-through-rate) for each ad. We offer many advanced features such as geographic/language targeting, campaign tracking, automatic optimisation and more. We can even serve HD ads to users with Retina or high DPI screens, ensuring your message looks as amazing. Download our media kit for full details of how advertising works, including prices and website statistics broken down by language and region.